The Jindivik had an impressive performance with a MTOW of 1656 kg or 3650 lbs, a maximum speed of 490 kt with with a limiting Mach No of 0.86 and a ceiling of ceiling 63,000 ft with wing extensions. The design of the Jindivik was a collaborative achievement between the Australian and UK governments, the Government Aircraft Factories and CAC at Fisherman's Bend in Melbourne and Weapons Research Establishment at Salisbury in South Australia. A variant first flew in 1950 and continued providing outstanding operational service for over 50 years. Arguably the worlds most successful subsonic drone. This image of a RAN Jindivik N11-603 was taken by Graham Wood in the 1980s from a McDonnell Douglas A4G Skyhawk during development trials of a tow. 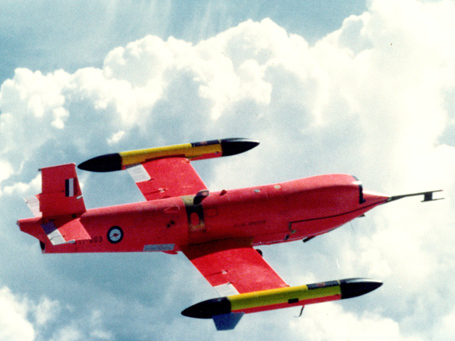 The Jindivik was a pilotless high-performance remotely controlled target drone. Powered by one 1134 kg (2500 lb) thrust Bristol Siddeley Viper Mk 201 turbojet. It had a span with camera pods and wing extensions of 7.92 m (26 ft 6 in), a length of 7.11 m (23 ft 4 in).